The well-preserved 19th century stone/wooden banked barn of Manchester Township Historic Home #2 is part of an original tract of 256 acres, named "Long Ridge," which dates to a 1766 patent obtained by George Schrumm. 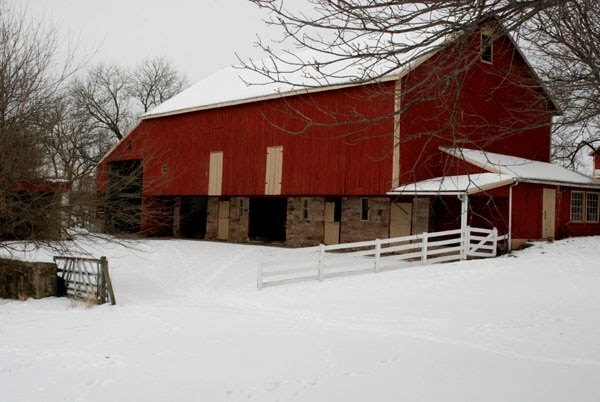 Today, the barn is owned by Mike and Debi Beshore. For more information on this home, see MTHS ID: 2 in the Historic Places Register. MTHS preserves and documents the history of Manchester Township in York County, Pennsylvania. Our mission is to gather information from available records along with individual personal interpretations of township history. Further, we disseminate historic information to the public in a useful and interesting manner including publications, workshops, and seminars. Learn more about us at About MTHS. August 20, 2016 Antique Appraisal Festival, Historic Shady Lane, 10 a.m. to 3 p.m. Appraisals by Cordier Auctions and Appraisals, Harrisburg. June 26, 2016 A new page! Hand-me-down Recipes. Send your favorite family recipes and we'll share them with everyone. Check back often to see what new, delicious, belly-pleasers have been added by friends and neighbors in Manchester Township. June 12, 2016 Edwin Sullivan contributes a new research article on the Knights Templar. Look for it in the Lumsargis General Profiles. May 12, 2010 MTHS added a new profile featuring an annotated chain of ownership for Historic Site 44 Mrs. Salor. Look for it in the Lumsargis Library. Brent L. Rodes, Harrisonburg, Virginia, has shared the genealogy of the Anthony Roth family and their connection to Manchester Township. Look for it under "Manchester Families." Ken Sunday, Man Twp, shares his genealogy of the Benedict Family of Manchester Township. Look for it in "Manchester Families."